I am still not a 100% onboard with reading comics online. I just can't get over the lack of a physical mag to paw and peruse, or missing out on the musty smell of a 40 year old copy of AQUAMAN. However, the opportunity to enjoy rare and hard to find Golden and Silver Age material is a blessing for us mere mortals who can't drop hundreds of dollars on single issue. 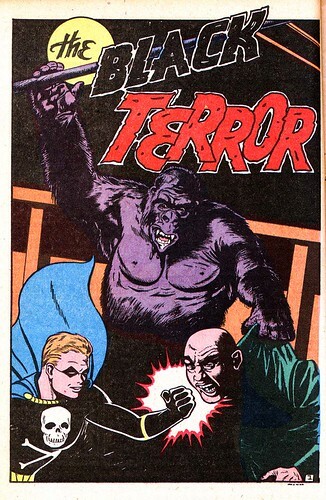 I was extremely pleased to stumble across this Black Terror tale with a gorilla twist on the impressive Nedor-A-Day blog.